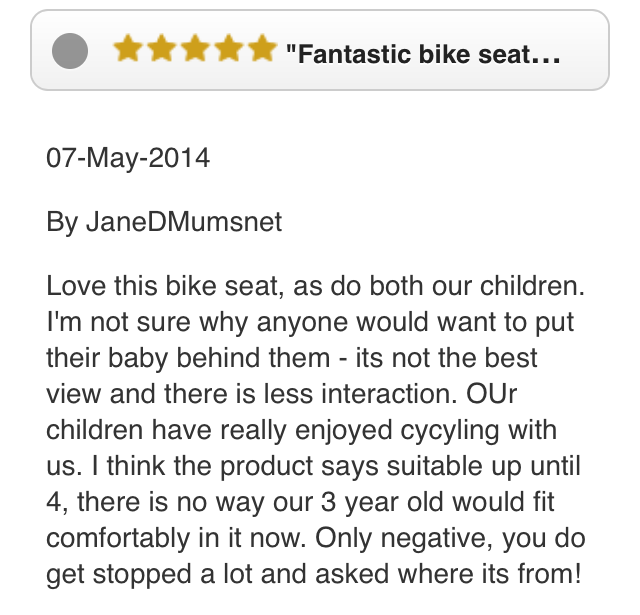 Safe, secure, easy to fit – our WeeRide Child Bike Seats are ideal for kids aged 6 moths to 4 years. I’ve been waiting to start cycling again since our baby was born. 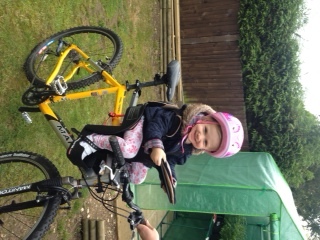 Now she is one she’s big enough to fit into a bike helmet and strong enough to support herself in a seat on my bike. 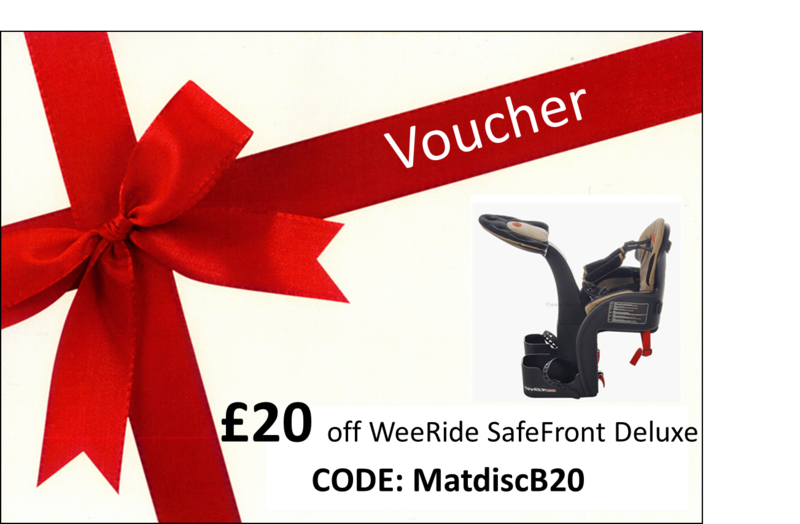 Step forward the WeeRide Safe Front Deluxe. It’s a front-mounted seat, attached to a centre mounting bar between the handlebars and your own seat. 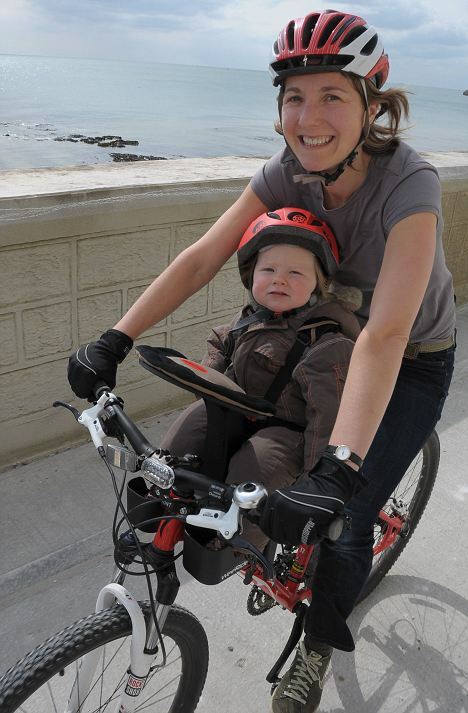 The child’s weight is put to the centre of the bike so cyclist and passenger are much more stable, and your little one is visible at all times too, so you can see exactly what he or she is up to. The mounting bar felt strong but not needlessly heavy and was relatively easy to fit. We needed an allen key and spanner to attach it, which are provided, and our own screwdriver. The instruction manual was straightforward but anyone worried about their technical capabilities could also watch a quick tutorial on Weeride UK’s website. There’s a reassuring no-nonsense Aussie presenting a five-minute video which is simple to follow. 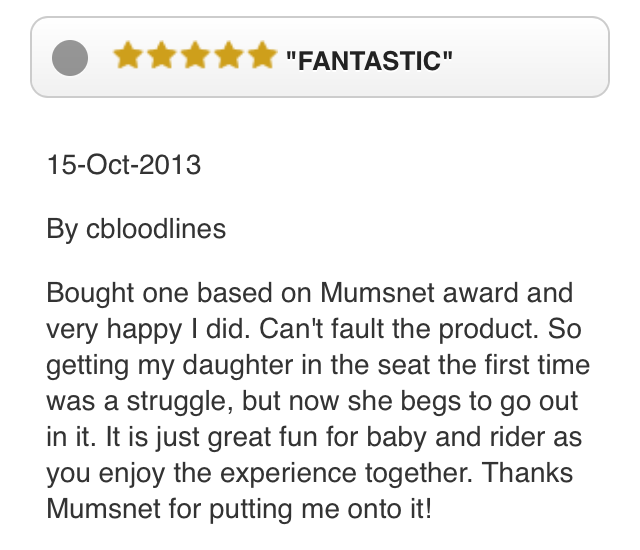 The WeeRide is designed to take children from aged one to four, weighing up to 15kg (33lbs). When I opened the box I was worried the seat itself looked surprisingly small compared to rear-mounted bike seats. 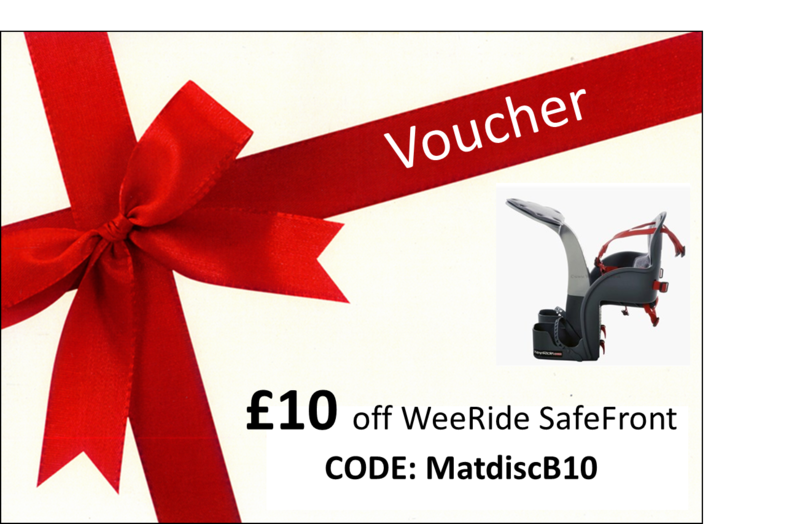 But there’s an additional WeeRide UK guarantee that your child will fit at aged four – and if they don’t you’ll get 50 per cent of the purchase price back. That seemed an especially good deal when children are notorious for growing out of things so quickly. We adjusted the five-point seat harness and altered the foot rests so Catherine fitted comfortably, then took her out again to get the seat onto the bike. It is fixed in place with a newly-designed ‘two-movement’ thumbscrew – so you have to push the screw down and turn it at the same time, as you would a childproof medicine bottle. The new model Safe Front Deluxe also boasts a two-movement buckle release on the safety straps, again so that prying fingers can’t work out an escape route as you are on the move. The footcup holders now have an extra strap as well so wriggly toes can’t stretch out as you do the pedalling. WeeRide seats all come with a pedestal in front of the child which means weary passengers can rest their heads and fall asleep as mummy or daddy do all the hard work. WeeRide recommend a test drive without passenger to get used to the seat, and I was pleased that it didn’t feel any heavier to cycle – even uphill. Once baby was in I set off tentatively in low gear. My bike is a 17-inch frame mountain bike – the seat fits any bike with a minimum frame size of 16 inches. I found I had to ride with my knees splayed out slightly because of the small frame of my bike but this became quite easy to get used to. It felt safe to have my arms wrapped around Catherine and because she was facing the world in front of me she could enjoy the view rather than staring at my back. 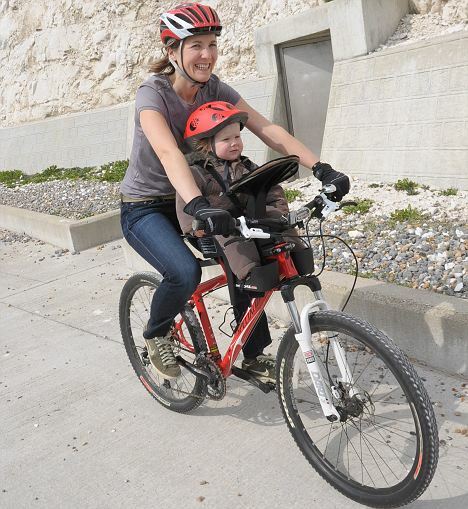 As she pointed at things and babbled away in babytalk I could see what she was looking at – passing dogs on the seafront, other cyclists heading in the opposite direction and the occasional low-flying seagull. We could chat about people and places – definitely something that will be of benefit as she gets older and starts talking more. Stopping was not a problem because the additional weight is to the centre of the bike – when you put the brakes on there’s no sudden tilting of the back of the bike. I was nervous about balancing with a growing toddler wriggling on the bike but when you cycle on flat-going there is barely any difference to the ride and I felt very safe. It came as something of a surprise when we reached our first major hill and my fitness was put to the test – the WeeRide felt so comfortably balanced it was easy to forget about the extra few pounds on the bike until then. Just one thing…you might have to move your bell further out of reach…unless you’re happy to pedal along with the passenger merrily ting ting tinging.